The Tarot is often understood as a metaphorical journey of life and offers enormous learning and guidance when considered from this viewpoint. You will be introduced to the basic structure of the Tarot with an emphasis on the meditative application of the symbology. 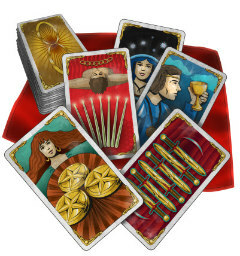 Through the use of your personal Tarot deck as well as journaling on specific cards, the student will acquire an objective and subjective introduction to this mystical philosophy. Please read: Bellevue Library Branch is NOT wheelchair accessible. Students who own a Tarot deck with major and minor arcana are welcome to bring it to class. Also, please bring a journal. Class 2- Please bring your chosen Tarot deck and a journal.